This software allows you to: (i) Display the current phase of the Moon. (ii) Calculate the phase of the Moon for any time in the past or future within a 9000-year period. 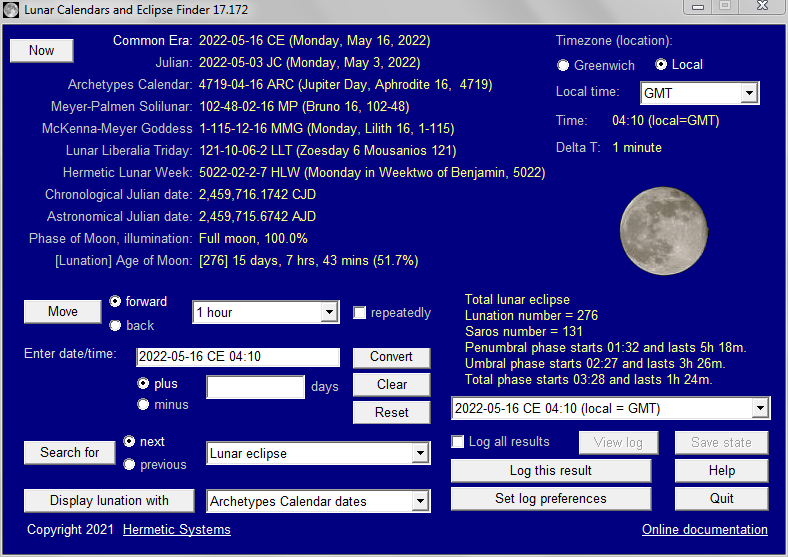 (iii) Convert between dates in various calendars: two solar calendars (the Gregorian Calendar and the Julian Calendar) and five lunar calendars (the Archetypes Calendar, the Meyer-Palmen Solilunar Calendar, the McKenna-Meyer Goddess Calendar, the Lunar Liberalia Triday Calendar and the Hermetic Lunar Week Calendar). (iv) Move forward or backward from a given date either by a period such as one month or by any number of days. (v) Search for the next or previous full moon, dark moon or first or last quarter. (vi) Search for the next or previous eclipse of a certain type: lunar or solar, lunar, total lunar, total or umbral lunar, solar, total solar or annular solar. ArtIcons Pro 5.49: You can create, edit, import, export and find icons and manage icon libraries Smart PDF Creator 14.4: You can batch convert all your printable documents to PDF format fast and easy. HDD Regenerator 2011: HDD Regenerator repairs bad sectors on hard drive surface. Smart SWF to AVI Converter 12.3: Swift and easy conversion from SWF to AVI with batch conversion.